Welcome to the Re-Enactment page. Here you will find more information about joining our Re-Enactment part of the event. Re-Enactment groups are assigned to their stands, which have a depth of 10 meters. When you subscribe your group, via our subscription form, please let us know what your desired width for your stand is, in meters. Multiple re-enactment groups are building a themed stand, so please provide us with more info about your own group. This way our organisation can imagine what kind of themed re-enactment group you are. Tents and military are allowed on the grass. Non-military tents and materials, however, are not allowed. Please keep the event in a military fashion. Full stand has a 4 meter width per vehicle. 10 meters concrete are for displaying your essential, military vehicle. 10 meters grass are for your military tent and/or military trailers. Please note that no vehicles are allowed on the grass and we request that all vehicles, tents and materials are in military fashion, as stated in our house rules. The organisation will thoroughly check that you abide by these rules. At our Re-Enactment office you are able to register your vehicle. To speed up the process we advise you to register your vehicle beforehand. The office is located at the entrance, just before entering the airfield coming from Gate 1. By passing our office we will register every vehicle by their number plate. You will receive a parking card, please display this just behind your windscreen so that it's visible at all times. For each subscribed Re-Enactor, you will receive a wristband for a full weekend. Our stewards will help you by putting them on. For this reasons all attendants need to be present at our office when arriving at the Wings and Wheels domain. Attendees not present are obliged to pass by our office at a later moment. Attendees that are not on our subscribers list, are of course welcome by buying a day or weekend ticket. Children younger than 12 years old, will have free access. Wristbands need to be worn at all times, access is prohibited without it. These bands are personal, they cannot be changed, swapped or lent to someone else. All your vehicles, Military or not will receive a display parking card. This needs to be behind the windscreen at all times. Military vehicles, that are on the airfield itself and on display will receive a GREEN parking card. Other, non-military vehicles will receive a RED, and free, support parking card. 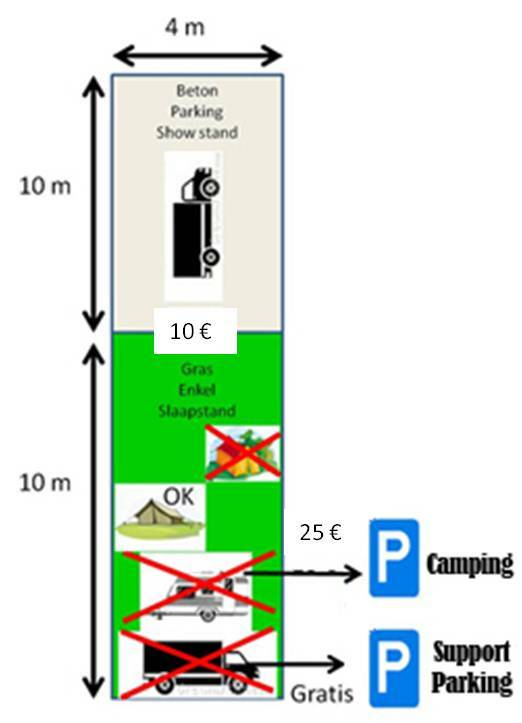 The support parking, however, is not a place for camping in any way (caravan, mobilhome, tents ...). It is solely ment for parking your other, non-military vehicles. Please note, that these cards are unique per vehicle, as their number plates will be registered at our office. For a price of €10, you can park your vehicle on the extra parking place located near the Wheels Office. This is a guarded parking place between the Wheels Office and Checkpoint of gate 1. (The organisation is not responsible for anything that happens to you or your vehicle). You will receive a BLUE parking card after payment of €10, it can be bought either at Checkpoint 1 or the Wheels Office. As mentioned above, there is a free support parking available. This parking place is reachable through gate 1 on Friday, Saturday until 8 AM and Sunday until 8 AM. On all moments, after Friday, this place can be reached through Gate 5. Do note that Gate 5 is closed from 3 AM on Saturday and Sunday. Should you have the need to stay the night, but you don't have a military fashioned tent or anything, then you can do this on our specific appointed camping places. Your mobilhome, caravan or tent, joined by one vehicle can be placed on a camping spot. This spot costs €25 and can be requested when you arrive at the event. Toilets, showers and non-drinkable water are included in your reservation. When payment of €25 has been fulfilled you will receive a YELLOW parking card, to be displayed behind the windscreen. Entrance to the event and its domain is only allowed when you are approved by the Re-Enactment Office. After your information, ID, subscription has been validated by the office you are allowed to enter. You must enter via Gate 1, which you can find on the Map above. Your civilian vehicles are not allowed in the Wheels zone, except for unloading and loading purposes. They are completely forbidden on saturday and sunday between 9 AM until 5 PM. Each attendee / Re-Enactor, that is on our subscription list, has free access. Each attendee must pass by our office for a wristband. Attendees that are not on our subscription list, are very welcome by buying a day or weekend ticket. Childeren younger than 12 years old, have free access. Attending the event with a display or compound. Meaning: attending the event with a group and not as an individual. Subscribed before the start of the event (whether or not via our subscription form). Recognizable, as they are a part of the re-enactment group and belong to the themed group by wearing the appropriate (military) clothing. The following prices apply per vehicle, and are at all times subject to changes. Per vehicle a €10 fee, for the full duration of the event*. *A vehicle that has not been subscribed before closing date (3rd August) will have a total cost of €15 per vehicle. Payment details of the organisation can be found on the About Us page. Please use your subscription number in the payment details. Subscribing your Re-Enactment Groups and / or Vehicle(s) can be done via the following page: Subscribe Re-Enactment. Please enter all the required details and further follow-up will be done via e-mail. A confirmation of receipt of your subscription will be sent to you via e-mail. Please note, that subscribing your Re-Enactment Group, your vehicle(s), and attending to the event is subject to our Terms and Conditions.